The shtetl of Dolina and the origins of the Weinbergs. The Jews of Dolina in what was Austo-Hungarian Galicia ( now Dolyna, Ivano-Frankivsk Region, Ukraine) trace their origins back to the times of the Polish kings who had conquered Ukrainian territories. My uncle, Dr. Benjamin (Munio) Weinberg travelled back and forth in the former territories of the Austro-Hungarian Empire as a lawyer and businessman and found ancient records in the town’s archives. He reported having found documents dating to the 16th Century, when a progenitor of the Weinberg family ( with name registered as Turteltaub) came from Turkish held regions to Dolyna. During the time of massacre of Jews in the Ukrainian territories of Poland by the Cossacks in 1648, the borders of the Ottoman Empire came just north of the town of Dolyna so possibly these regions were spared the massacres. Sephardic Jews came as administrators or merchants into those territories. ( I presume Turtletaub is a later “Yiddishization” of what may have originally have been a Sephardic/Spanish name, perhaps akin to “ Paloma” or “Tortola”). This first ancestor of record established the Jewish cemetery and built a house there, which was still in use at least till 1917, and the family members were always given the choicest burial plots. He opened and operated salt mines under contract from the local aristocrat. By the 17th century, the first “Weinberg” was registered in the Grundbuch, land registry, of Dolina in Latin, German, and Polish. (Note: This Dolyna/Dolina is not to be confused with another Dolina, which was formerly called Janow. Such confusion of place names is common in East Europe where cities have changed nations so often in the past century). The first of the Weinbergs of whom we have greater detail, Mordecai Weinberg, was born at the time Napoleon delivered the Austrians a sound defeat in 1800. He was reported to be unusually strong, and could smash a table, but, like so many of his contemporaries , he made his success by his business acumen. He bought up rights to farms and owned a 100 acre farm himself .With time, he established a lumber business. Typical of the Jews of his day, he was devout, and was eager to support his community. He established one building in Dolina to house 3 synagogues under one roof, gave land for the Klos, a small chapel for the very pious mystics, a Beis Midrash,(House of Study), a Mikveh, ( ritual bathhouse), and house for bath supervisor. To each son he gave a house, and a set of Shas, Talmud, in shining leather. He then set off, at the age of 80, in 1880, with his wife, to Palestine just ahead of the Bilu ( a pre-cursor to the later Zionism of Herzl). He came, not as a colonialist, not as a usurper of someone else’s land, but as a pious Jew who wished to live his last days in the mountaintop village of Safed, home of the great Kabbalists. He brought with him his sterling silver cutlery and jewelry. Sadly, he and my great-great grandmother were murdered by Arab marauders in 1896. One of the sons to receive a Shas and a house was Hirsch Zvi Weinberg, born in 1835. He married Rachel Schumer, born in 1846, the sister of a wealthy man and it is said that she was the businessman in the family. They operated a clothing business in Dolina. Rachel passed away in 1906, and Hirsch Zvi, in 1918. They had several children. One daughter Sarah, married the editor of the Hebrew language paper of Vienna, Jonah Gelernter. There was also Perl, whose daughters, Rachel and Ada would make Aliyah to the Jewish settlement of Palestine, and Lippe. Another, Marcus, whom I met as a student, became a successful international import-exporter in Milan. One of their children, Shmuel Weinberg, born in 1872 was energetic, and already as a young man had nudged his father out of the family clothing business, and took over operations., One of his nieces, whom I met when I was in Israel as a college student, was impressed by something clever I had said, and commented,” I can see you are a Weinberg”. That was the family reputation—sharp and clever, shrewd in business. He married Binah Zarwanitzer a few years before the turn of the century. They had two children, first ,my uncle Dr. Benjamin ( Munio) Weinberg, born in 1899, who became an attorney and businessman, and my father, Rabbi Dr. Wilhelm(Zeev, William) Weinberg, a Zionist activist and Rabbi, born in 1901. ( approximately $ US 100,000, equivalent to $ 2,150,000 today. 5 Krone= 2 ½ ruble=$1) up to outbreak of World War I. His income was derived from the purchase of bankruptcy liquidations. For example, he would purchase 1000 suits and sell them $4,$ 6,or $ 8 . The entire fortune was wiped out by the outbreak of World War I in 1914. Galicia became the center of fierce fighting between the Kaiser’s and the Tsar’s armies. Samuel dodged being drafted into the desperate Austrian army, and fled battlefront with his family to Vienna. He came to Vienna a poor man with wife and sons to feed. He and the sons, my uncle, Benjamin, and my father, William, young teenagers, made insulation for the Austrian Army- the sons shredded paper to stuff in the coat lining. Samuel knew the expression of the Talmud-“Hacham, Eynav berosho”—The wise man keeps his eyes in front, wide open. He saw how the coat was being made, looked at the cloth, the stitching, the lining material. Within a short time, he determined who were the suppliers, then went to the officials in charge of military acquisitions, and sweet-talked them into a contract for manufacturing the coats. He then continued to buy up textiles and sell to other refugees. His business operation was to send silk to Poland, bring Polish merchandise to Trieste, bring rice and steel to Vienna, and around again. He eventually once again opened a small bank, with easy lending policies and, among other projects, financed a flour mill. He was generally trusting, for all his acumen, and often lost much to bad borrowers. As my uncle, Benjamin stated it, the word, in Vienna, was’ Munio cannot make money as fast as Shmuel can lose it.” Among his partners was the father of Professor Moshe Zucker, of the Jewish Theological Seminary, my teacher , and an elderly gentleman whom I met by chance one day during Sukkoth in a synagogue in the Bronx! With the Nazi Anschluss, the prelude to World War II, all was lost again. For example, he had 80,000 Marks in Fiat stock alone that would have been worth $16,000,000 by stock market average growth. At some point, after the Anschlus, my grandmother was beaten. I have a photograph of my grandmother, her hair disheveled, a mark of some kind of trauma; it bears the stamp of the Polish consulate and I can only presume that, after the Anschluss, they were relegated to being citizens of their land of birth, Poland. They fled to Italy and then survived the war in Zurich, Switzerland ( most of what he had saved probably went to pay for a visa in to Swizterland) . Binah died in Switzerland after the war. In 1950’s, Shmuel came to Canada, to be with his son, Munio ,and then commuted between son, Munio, in Canada, and son William, in the US. While always observant, he was a self-educated Maskil ( enlightened modernist) who sent his sons to modern schooling, even while he did all his business dealings in Yiddish. He became deeply pious in his old age, studied Talmud with angels who sat at his bedside with him, left notebooks of Kabbalistic prayers, and went to Chasidic shtiebelach to worship. This strange confluence of ancient and modern in Shmuel Weinberg was typical of the currents that passed through European Jewry in the previous centuries. Like all Jews until the rise of the State of Israel, he lived in only one city “Yerushalyaim shel Maalah”, the mystic Jerusalem of eternity, and on his entry visa to the United States, his nationality was “ Stateless”. He passed away a few days before my Bar Mitzvah in Washington, DC, in October of 1961, still “ Stateless”. Yichus—Ancestry- played a great part in Jewish circles. After all, the very Bible itself is a list of “begats” from Adam down to the lists of returnees from Babylonian captivity ; from the “ Hebrew “ Scriptures it goes on into the “ Christian” Scriptures as well. Thus it turns out that Jesus and I share the same yichus : King David and Aaron the first Cohen, High Priest. While this may be wrapped in myth or faith, what is clear is that, in 11th century France, there lived the shining light of Biblical and Talmudic clarity, the Sage, Rashi, who, by tradition, was a descendant of Kind David. Centuries later , the descendants of Rashi became the leading Rabbinic scholars of European Jewry and prominent European intellectuals and political figures, such as Karl Marx or Lazar Kaganovich ( Number Two Man in the Soviet Union under Stalin—not all is honorable) . Somewhere in the mix of families there is one Rabbi Saul-Wahl Katzenellenbogen, who was reported to have been King –for- a- Day of Poland. One of these descendants was Rabbi Yom Tov-Lipppman Heller, Chief Rabbi of Prague and later Cracow in the end of the 17th century. Every popular printed edition of the Mishnah has his marginalia, the Tosafos Yom Tov , printed alongside the text ; he himself was the object of false accusation by fellow Jews and persecution by Christian authorities . His daughter, Reziel, married Rabbi Yaakov Yosef Heller-Kahana, himself was a descendant of R. Nathan of Rome, a Cohen, who appended the Aramaic version, Kahana, to his name. Years later, the Kahanas settled in Sighet or Maramarossziget, Hungary( now Sighetu Marmatei, Romania)and became the prominent Jewish family of Hungary. ( Perhaps the best know native of Sighet today is the Nobel-Prize winning voice of the Shoah, Elie Wiesel, also a descendant of the same Tosafos Yom Tov). 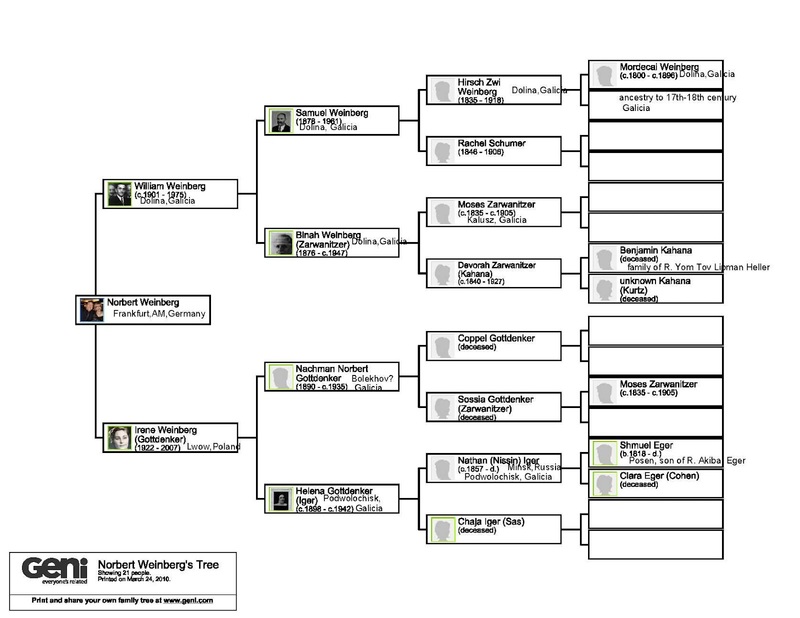 How does this “yichus” enter the Weinberg clan and how does it make me my own third cousin? His parents died in a plague when he was only 4 or 5 and he never attended school; without formal schooling, he started in life without being born into “yichus”, so he had to make it on his own. He became a builder and contractor for the government and proved that intelligence and diligence beat formal schooling. He went on to build a railway station, a slaughter house, and schools, distribute wine and liquor, open a salt mine operation, and operate a rail line for lumber transportation from the forests to the mills; he did this all the while by keeping his reputation unsullied, and he and never broke a contract.” We never had trouble with him” was the word . Only once was he outbid on a government job, by a Polish engineer, who then went bankrupt ;he took over the job and succeeded. He also sold wine and liquors. (A brother of his owned a lumber mill near the railway, 40 miles away from Dolina, and also produced barrels. He passed away when he was in his high 90’s, in 1941. He had 5 sons and 1 daughter, all of whom died in the Holocaust). He became President of the Kultusgemeinde( Jewish community) of Dolina and kept the Keter Torah ( the silver crown placed on the scroll during the service) in his house for safe keeping. His first wife, a woman whose name I could not find in my records, would be my great-great grandmother, through the daughter born to them, Sossia, my great-grandmother, through her son, Nachman Gottdenker, my grandfather on my mother’s side( he would marry a great-granddaughter of Rabbi Akiba Eger). The first wife, however, died at a young age, and my grandfather by this time had become a prominent leader of his community. He had created his own “ yichus”. Therefore, he came to ask for Devorah Kahana’s hand. They had a daughter, Binah, who married Shmuel. Moses also had a son, Judah, whether from the first or the second wife, I cannot tell. Moses and Devorah had a daughter, Binah,or Biniah as she was sometimes called, was born in 1876. She was the only other grandparent, besides her husband Shmuel, to have survived the Holocaust, but she, too, passed away before I could know her. I have only a few recollections about her from my father. When he was a young man, in Austria, he was an eager Zionist pioneer. He volunteered for Hachsharah ( Preparation Camp) and spent time on a farm, preparing to be a chalutz, pioneer, in Israel. He gave up on his dream when he realized that his mother wouldn’t stop crying. When my father went to Berlin to Rabbincal School , Binah baked a special cake for him and packed it in his suitcase. When he arrived, he unpacked everything into the dresser in his room. At the end of the school year, he dutifully repacked his belongings, only to find the cake, still uneaten, in the drawer. When she and Shmuel were living in Switzerland, my mother, Irene, young and beautiful, wrote her.” I don’t understand your son .Here I am, an attractive young woman, and he shows no interest in me. Tell him to look at me.” She told him and he proposed. She died a few years after the end of World War II. My father explained that she had suffered so much from worry for her children when they were in exile deep in the farthest regions of the Soviet Union, that when she knew they were well, the strain took its toll on her heart. When my uncle, Munio, was in his high 80’s, he took the long and uncomfortable flight to Zurich. He claimed it was to exchange dollars for Swiss francs. He really went to visit her graveside.